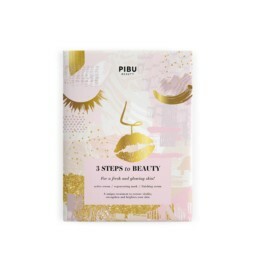 The PIBU Beauty brand was established in Seoul, in the laboratories of one of the largest manufacturers of Korean face sheet masks. The philosophy guiding the brand is the embodiment of the Korean approach to care – „Skin first, make-up second”. Healthy, moisturized and radiant skin is the most important. Their motto “Let the skin do the talking” means that it is the skin that should speak for itself. We only listen to its needs and provide it with essential nutrients to improve its condition. Our complexion is our ‘business card’ so if we want to preserve its beauty, taking care of it should become our daily ritual. This brightening mask is a wonderful remedy for fatigued complexion and uneven skin tone. Its genuine, brightening ingredients revitalize your skin and reduce visible dark spots, making your complexion look radiant, toned and healthy! The mask also neutralizes the harmful effects of UV rays, unhealthy diet and stress. After just one use, your skin becomes visibly bright and vivid! A sensational bubbling charcoal mask deeply purifies your skin making it silky smooth, firm and elastic. Its unique ingredients tighten your pores and exfoliate dead skin cells, giving your skin a healthy glow. As soon as you place the mask on your face, you can enjoy the pleasant feeling of the bubbles at work. They help your skin absorb active ingredients with a nice massage! After you remove the mask, your pores are less visible and your skin looks fresh and blooming. A mask that was designed to make your skin flourish! Clay clears pores and minimizes their visibility, while the unique combination of flower extracts soothes your delicate skin and makes it brighter and refreshed at the same time! Clean, radiant skin is now right at your fingertips! The hydrating-soothing mask is an instant and long-lasting rescue for skin in need of intense watering. The mask moisturizes your skin deeply, making it look and feel calm and hydrated! 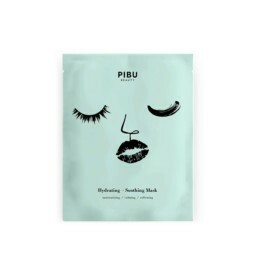 The soothing formula of Pibu’s mask retains your skin’s own moisture. Keeping your skin supple and smooth when it needs it most. The green tea purifying clay mask is a handy rescue for skin with imperfections. The cosmetic clay absorbs excess oils, draws out impurities and clears breakouts, giving your skin a balanced and matte look! If you are looking for a way to clean and tighten pores without drying your skin out – reach for our clay mask to gain desired effects right away!